I arrived at Land Between the Lakes late in the afternoon of April 18. As dusk approached, I noticed it was almost dead quiet. No birds were singing, no frogs were calling, and I heard not a howl or yip or chatter from anything furry. But there was one sound that stood out: the incessant soft chirps of crickets, calling from under the leaves along the sides of the dirt roads. An April Chirper, sounding off at dusk from under leaves at the edge of a road. Recorded by Lang Elliott at Land Between the Lakes, Kentucky, April 18, 2010. So who is our little April Chirper, sounding off months before nearly all other singing insects will be heard? 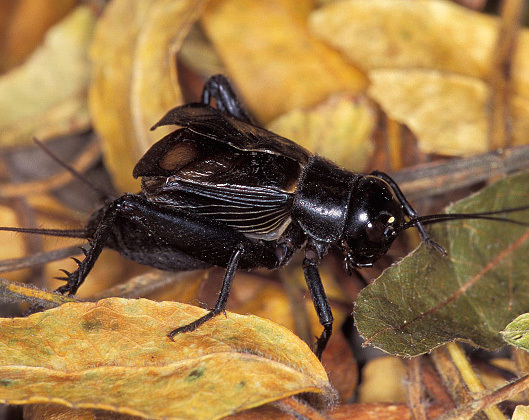 Our handsome little singer is the Spring Field Cricket, a shiny black cricket about 2/3 inch long. The Spring Field Cricket, Gryllus veletis, looks identical to the Fall Field Cricket, Gryllus pennsylvanicus. Once thought to be the same species, scientists confirmed that they are morphologically identical but developmentally distinct. Fall Field Crickets overwinter as eggs, as do the vast majority of temperate zone insects, including nearly all the singing crickets and katydids. Adults mature in late summer, and the songs of the males can be heard from late July or August until the first hard frosts. Spring Field Crickets, however, overwinter as nymphs, which quickly develop into adults (only the males sing) when warm weather arrives. Halleleujah—let the insect concert begin! Spring Field Crickets range across much of the Northeast and Midwest. They continue their chirping until late June or early July, at which time the adults finally die off. Eggs hatch in the summer and develop through late summer and autumn, the large nymphs surviving until the following spring. How nice it is to hear crickets chirping in the spring! I am thankful that the Spring Field Cricket is a rebel among the insect musicians, a real non-conformist who sprinkles its bright chirps on the springtime landscape when other singing insects are but tiny little hatchlings capable of little more than a whispering hush as they scurry from place to place. Excellent! I too always thought there was just one species of Field Cricket, but I guess not. Winter is approaching, and it’ll be silent at nights, unless owls are hooting in nearby woods. I like the crow in the background because of its “echoey” quality. Terrific. The insect chorus is heading north. We should be hearing them soon. Fantastic audio, I’m looking forward to hearing this spring rebel in the coming weeks up here in Massachusetts. Thanks for sharing.